Today ohiophotogrl had school so I stayed home with the dogs. So I caught up on all my shows……you know NCIS, Big Bang, and Batman just to name a few. Think we are going to the gym tomorrow can’t wait! This entry was tagged 365, entertainment, fun, laugh, Mr. 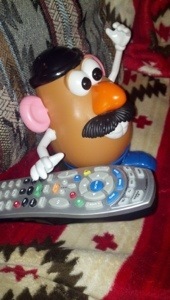 Potato Head, muse, photo a day. Bookmark the permalink.